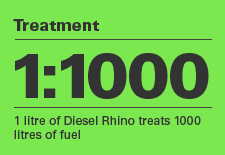 Diesel Rhino is a new,advanced formulation Eco friendly Diesel Fuel treatment designed to improve the quality of modern diesel. Diesel Rhino Increases Fuel Economy, Increases ignition quality which reduces engine vibration and increases performance. It lowers harmful exhaust emissions which can prolong the life of the DPF. Diesel Rhino also Cleans and Lubricates the Fuel pump and injectors protecting against premature failure of Diesel Injection Systems. Diesel Rhino provides multiple benefits in one easy to use additive. • Improves and Restores Lost Performance. • Increases Fuel Economy by up to 10%. • Reduces Emissions by up to 60% & helps prevent blockage of Diesel Particulate Filter. • Cleans Injectors and removes deposits from Diesel Injection Systems. • Lubricates & Protects Fuel Injection System compensating for Low Sulphur Diesel. • Removes Water From Fuel. • Increases Cetane by up to 6 numbers. • Inhibits Oxidation and stabilizes fuels.